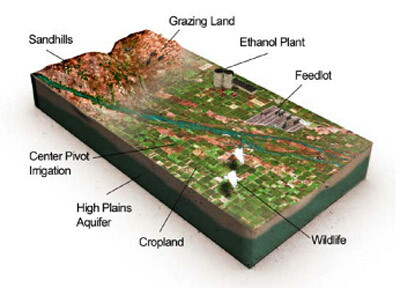 The University of Nebraska-Lincoln (UNL), the USDA-ARS Agro-ecosystem Management Research Unit (AMRU) in Lincoln, and Environmental Management Research Unit (EMRU) in Clay Center propose to establish a Long-term Agro-ecosystem Research (LTAR) Network site with a focus on the northern portion of the High Plains Aquifer. Over 95 percent of the water withdrawn from the aquifer is for agricultural use, and – unlike the portion of the aquifer underlying southern Kansas, Oklahoma, and Texas where significant drawdown has occurred – ground water levels have remained relatively stable since 1960. However, this stability might be in jeopardy with projected climate variability and change for the region. Establishing an LTAR to examine and make available data regarding the northern portion of the aquifer will fill a geographical and hydrologic gap not currently addressed through the LTAR Network while complementing the Ogallala Aquifer Initiative, established by USDA in 2003 to address unsustainable groundwater use in the southern portion of the aquifer. Provide scientific and programmatic leadership and infrastructure to ensure the Platte River – High Plains Aquifer LTAR functions efficiently and effectively in accomplishing its mission and is responsive to emerging data needs and challenges. Collect and make available a core set of common measurements that will be compatible across LTAR sites, meet established quality standards, and be maintained in a Network agreed-upon, publicly-accessible format. Develop research partnerships with a wide variety of stakeholders, including other local, state, and federal governmental agencies, universities, and the private sector, to develop the depth and breadth of expertise necessary to compete for and secure funds to support collaborative long-term research. Participate in LTAR Network meetings and workshops to share research progress, discuss methodological and operational issues, and plan future Network activities and initiatives. Experienced personnel affiliated with multiple core geographical sites located across Nebraska will collaborate to accomplish these objectives. Data sets and research experience provided through this LTAR fall within four primary research clusters, all of which are of significance to the LTAR Network: cropping systems, beef cattle and grassland systems, water resources, and regional modeling and integration.